← About Probiotics ~ Are They Right for You? It was a gorgeous sunshiny and very windy day in Joplin, had I stopped to notice. But I didn’t slow down as I was in hurry mode that afternoon. I had a check off list with many “to do’s” still left undone. Across town I ran into my realtor’s office to drop off what I hoped to be the last of extensive paperwork before finally selling our house. You see, I had been living in this ninety year old house of our dreams, alone. Now having dealt with open houses, realtors, criticism, frozen pipes and a tree branch that crashed through the front porch, the dream was long gone. It just HAD to sell this time. My husband had been forced to move on to start his new career in Oklahoma where he was living in a hotel. The entire situation was growing older with each day and I’m afraid my usual Pollyanna attitude had turned Cruella. Alright, if you know me, you know that is false. I am rarely Pollyanna. I am a realist. I don’t sugarcoat things, but I do always have a plan. I was beginning to lose all hope. And when you lose hope, ya got nothing. And then it begin to happen right before my eyes and I didn‘t even realize it until it was all said and done. You know, that moment that will forever change you life? The time you will continue to reflect upon in the years to come and try to draw from it? (I truly think these moments happen often, we just don’t slow down long enough to inhale them.) I was running back to my car when I noticed just on the edge of the parking lot, what looked to be a young homeless man. Having raised two boys, there’s always been a special place in my heart for young men in need of help, but on this particular day, as you recall, “Cruella mode”, I hugged my purse a little tighter and started moving faster to my vehicle making certain NOT to make eye contact. As I reached to open the car door left unlocked (I never leave a door unlocked! ), my attention was caught again by the traffic suddenly pulling over and halting. GREAT. A funeral procession and I would be stuck in this parking lot with a homeless man for how much longer?! Purse now thrown inside the car, I stood with my arm draped over the door, just observing. The motorcycle police lead, the hearse, the family cars following, the many friends. The entire world had stopped for this moment. Time stood still reminding me of loved ones I had lost. None-the less, here I am, waiting and giving in to the moment when I’m reminded again of the stranger I should be watching. 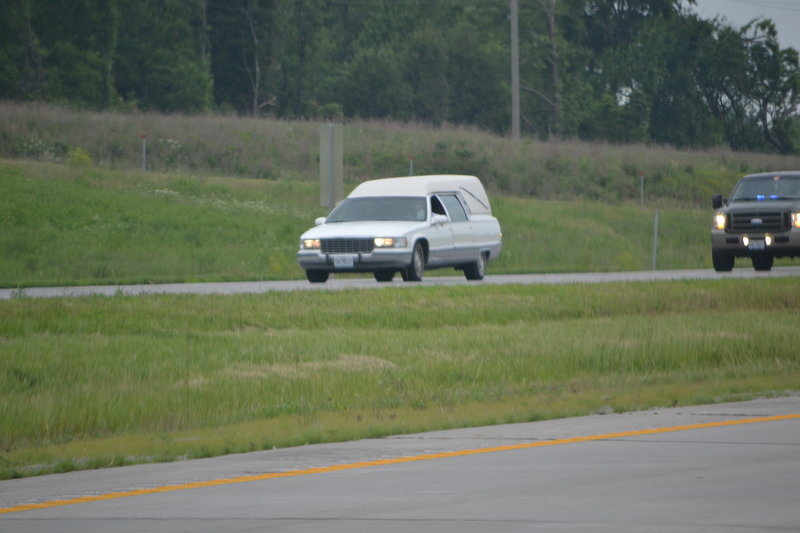 And there he stood aside this funeral procession, now drawn closer to the road like he was a bystander at a parade. He was at full attention with his body. He slowly pulled off his knit hat, revealing his oily, matted hair; he grasped that dirty hat with all his might, trembling as he placed his hand over his heart and bowed his weary head. He just stood there in that position for what seemed like an eternity, and he waited for the last car to pass. That forever moment was actually over quickly. He placed his hat back on his head and I jumped into my car, started the engine and turned where I could see him. I looked at this young man down on his luck that day. I cringed at myself for pouring out quick judgment on his life. I thought about his mama and his grandparents. Who had nurtured his beautiful heart that he would still harbor this honor and respect for other’s even when he was in a bad time of his own? I looked his way through the side window of my car as I began to pull out of that parking lot. He gazed my way too, but I was very careful not to make eye contact. I had an aching feeling that he would be able to read the depth of my soul and I was too ashamed for it to be revealed. This entry was posted in Uncategorized and tagged eye contact, from my heart, homeless, joplin. Bookmark the permalink. I would like to think I’m a person who does not judge, but I guess we all do some days, in some way. Your daughter sounds awesome, btw! Beautiful, beautiful story; so many things to be learned here! Hopefully, the day we stop learning is the day we stop breathing. When I see a homeless person, dragging all their earthly possessions in some grocery cart, I have to remember….at one time they were a sweet little baby that (hopefully) someone loved, and now they are down on their luck, and God wants us to love them as He does. But it’s so hard to trust in these pitiful strangers because we have been taught to fear them. Your little story is such a good reminder that underneath the dirty clothes there might be a person who just needs a smile from us, if nothing else. Thanks Paula! Sometimes the inside of my heart isn’t so nice…..and I don’t like that about me. That’s why I shared what happened with my “friends”. Maybe the reminder will help me for the next time around? Very heart warming article. We have no idea what caused his circumstances but for many of us not judging is very difficult. This is the type person we warn our children to be careful around and are we not teaching them to judge? Every day we read of abductions and robbers, how do we know who is the safe person, the fine young man in a suit or the grungy man on the corner. It is hard to know sometimes. I recall when we lived near one “not so nice” area in Texas, telling our boys, “Don’t make eye contact with anyone”. They were used to friendly little home towns and they would wave or made silly faces at everyone….I didn’t want them getting us shot. You are right. Raising children in our world now is difficult. How do we teach them to have a heart and be safe? A reminder to myself to not judge……. and to be kind to others……cause we don’t know what they might be dealing with today. what a powerful and beautiful post Paula. And… what a great reminder to choose Love over fear. Working in the homeless sector I find one of the hardest parts is people’s quick to judgement responses to homelessness. Too often we equate homeless with who the person is. homeless = criminal — when it is really homeless = homeless. That’s it. that’s the difference. Yes, there are choices made that led to that place called homeless — but homeless does not define the person, just as being housed, or being in the process of selling a house, or moving house, or building house defines anyone. Who we are is defined by what is inside us — and that young man has a beautiful, caring and respectful heart within him. Just as you do. We all judge. We don’t all pay attention to our judgements and grow through them like you do. Thank you. What a touching story, Paula. I’m sorry you are having to leave the home of your dreams. I also know that dreams follow you and that you and your husband have a bond that pulls dreams so that they never lose their threads from your heart to the hearts of those around you. I’m betting that young man felt the tug of your heart. Thank you sweetie….I hope he did. And “home” is wherever we are….together! A very moving account of your chance encounter with the homeless man. Paula. I believe that everything happens for a reason, and maybe he felt your empathy even without the eye contact. I am often tempted to try to find out more about how such people came to be in this unhappy predicament, but I guess I’m too much of a coward to even speak to them for fear of becoming involved. Thanks for sharing your experience here.